This entry was posted in Mrs. Della Tressel Album and tagged Della Hamilton, Della Tressel, Hamilton family history, Matter family history, Motter family history, Ruth Turner, Tressel family history, Turner family history. Bookmark the permalink. I recently ran across this treasure trove of information on the Motters. 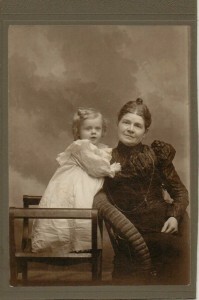 I found this picture of my mother Ruth Alice Turner and her mother Alice Tressel Turner. In some respects it does look like her but not sure yet. The picture of Floyd Turner is Uncle Floyd. My mother’s sister Nora Turner married John Peter Motter and there is the connection. As a boy I have visited with Aunt Della and Uncle Grant home north of Ada. The last time I saw Uncle Grant was visiting with him near San Jose, CA in the late 60’s. My Uncle Charles Turner spent many years working on 2 trees. The Turner and The Tressel trees were amazing when you consider what they were working with. Lots of letter writing. Could you can help me with the Matter/Motter name? It would appear that not only did the census takers change it back and forth but also members of the family. Thanks for all your hard work and a lovely website. John, I sent you an email….I’m looking forward to hearing from you.